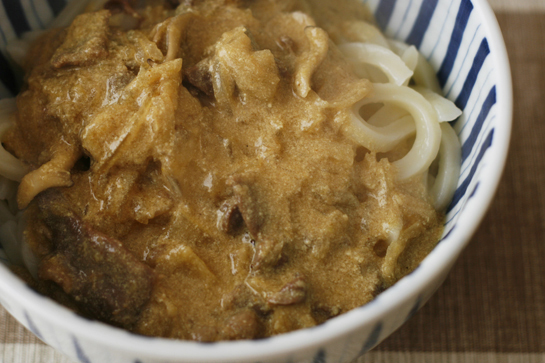 Curry udon has been the #1 request in my house. I came across several recipes, Keema Curry Udon with Burnt Tomato being one of them. While that recipe offset the robust curry with tangy tomatoes, this recipe mellows it out by using milk. The feathery maitake mushrooms and the thin-sliced beef add a great textural element to the dish. 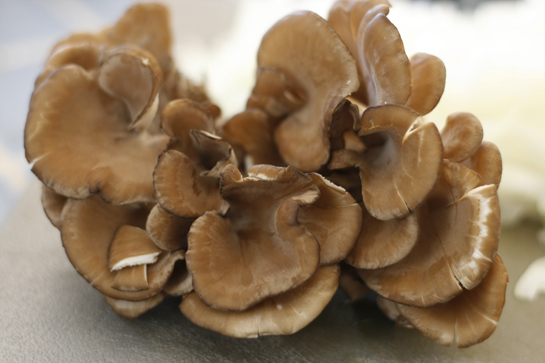 If you can’t find maitake, you can substitute shimeji or oyster mushrooms. For the udon, see this post for tips on which brand to buy. I like this curry udon a lot. Its use of milk is so unique and I know this will be on regular rotation! Heal oil in a medium pot over medium-high. Once it begins to shimmer, add the onion. Cook for 6 to 7 mins, stirring frequently. Measure 1/2 cup water and set aside. When the onion starts to brown, add 1/5 of the water. Continue to stir and cook until the liquid is gone and add 1/5 more water. Repeat with the remaining water. 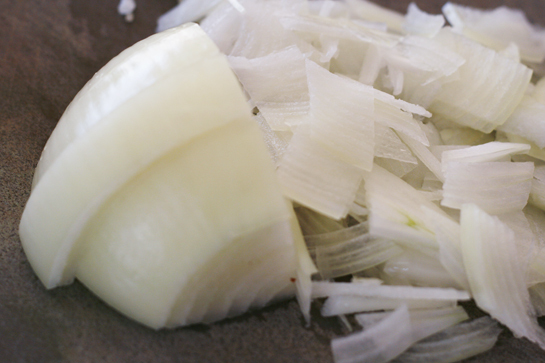 Once the onion turns a golden brown color, add the ginger and garlic and cook until fragrant. Add the grated apple and stir until the mixture thickens into a paste. Add mirin and bring to a boil. Add the milk and bouillon cube and stir occasionally until the cube is dissolved and it comes to a boil again. Reduce heat and simmer for 2 to 3 more minutes. Fill a large pot with water and bring to a boil. In the meantime, in the pot with the milk, turn off the heat and add the curry. Let sit for a couple minutes and stir around with a ladle, making sure the curry has completely dissolved into the pot. Turn to medium heat, bring to a boil, then add the sliced beef and maitake and cook for 5 mins. Turn the heat off and add a pinch of salt. Once the water comes to a boil, add the frozen udon and cook according to package instructions. Drain well. Divide among 2 large bowls, ladle the curry over the noodles, and sprinkle with freshly ground black pepper. 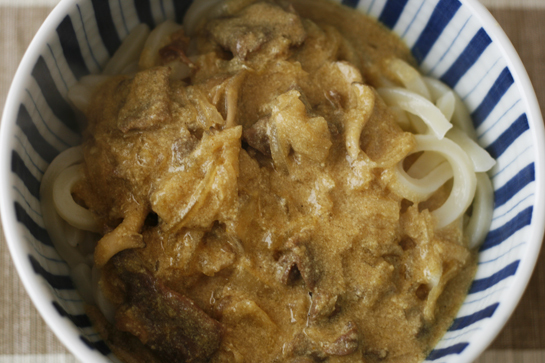 This entry was posted in Contemporary Recipes, Meat, Noodles and tagged beef, curry, Noodles, stew, udon, winter. Bookmark the permalink. Post a comment or leave a trackback: Trackback URL. This time, we decided to forgo the beef and instead used two packages of maitake mushrooms (so about 6oz total). I also was 1/4 cup shy for the milk, so added a big glug of sake (felt the curry was a bit too thick last time anyways). zyzzyva, I like the idea of an all-mushroom version! It’s perfect curry weather, too. Do you have recommendations for type of curry roux and cut of beef to use? Can I substitute butter for canola? I’m brand new to cooking curry! SC, it’s been a while since I’ve made curry, but I’ve used the Gokumarou brand. For the beef, I used thinly sliced beef used for sukiyaki but you could also use stew beef if that’s hard to find. Yes and yes for the butter and broth substitutions. Hope this helps and happy cooking!